The sunny nation of Australia could double its solar capacity by the end of 2018, analysts predict. The country’s solar energy boom has been spurred by solar projects large and small, with multiple industrial projects paired with the appearance of solar panels on buildings all over the country. The Guardian reports that last month saw the most rooftop solar installations in January to date, and one of the top five months ever, with 69 percent more panels installed compared to the same time last year. According to a blog post by James Martin of SolarChoice, an Australian power broker company, 1 in 5 Australian homes has now solar on its roof. South Australia — the country’s top solar state, and fittingly the location of Tesla’s massive backup battery — sees solar in 30 percent of homes. 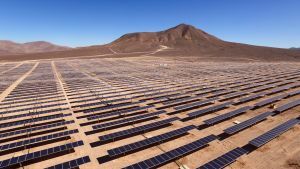 Compare that to the United States; though the solar industry is rapidly growing, the U.S. Energy Information Administration estimates it makes up about one percent of total electricity generation in the nation. This isn’t just because Australia has more year-round sunshine, though that’s certainly a factor (and a bitter one to acknowledge from within the current Northern Hemisphere winter). Martin explains that electricity prices in Australia are usually high, while solar installations costs in Australia are significantly lower than those in the States. This has driven many a frustrated Aussie to reach for solar panels in the hope of lowering their bills. Worldwide, however, solar energy capacity is skyrocketing, as is that of other renewables like wind energy. As countries transform their energy systems to prevent worsening climate change, it may be best for all to do as they do Down Under.